Not a bunch of posts this week because I went on vacation! My husband, Darcy, and I went to the spot my family went when I was a kid - Sea Ranch. It's on the Sonoma Coast and is absolutely gorgeous. Now, it is a typical Northern California beach, so we're talking sweatshirts and jeans. Darcy was such a trooper! I bought an Ergo Carrier and she absolutely loved it. Since she's only 3.5 months old, the sun is not her friend (and since I'm Irish, it's not my friend either), so I could put the little sun shade over her head and we could go for long walks along the huge bluffs. We rented a house, so we had our own kitchen, but I wanted to keep our meals as simple and easy to clean up as possible. We found these seriously outstanding Apple and Gouda sausages at Costco (you can find them here), where those little food sample people worked on me. I could have eaten the whole package. The other nights were burgers, lasagna, and Rachael's Honey Teriyaki Chicken. Looks like Rachael and her husband John might have some room for a bigger kitchen. Bellini Valli of More Than Burnt Toast tweaked Rachael's recipe for Roasted Garlic and Grape Tomato Pasta with Basil and Arugula. Blind Muscat recounts his experience at dinner with Rachael Ray (she was filming at a restaurant for Rachael's Vacation). Karen at Busy Mamas found a keeper with Rachael's recipe for Spiced Grilled Chicken. 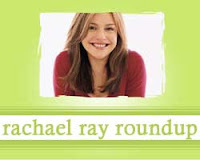 Us Weekly wants to know if you would feed your dog Rachael Ray's dog food. When I voted, the yes votes were winning in a landslide. Did you see Rachel Ray on the sweetriot blog?